German Cabbage - Common Types of "Kraut"
Cabbage as we know it is native to the Mediterranean region and has been around Europe since 300 BCE, but the wild type has been eaten by humans for even longer. It turns up in print in German herbals by the 1500s, although Hildegard von Bingen knew of cabbage, which she called a poison for the body, in the 1100s. Cabbage migrated to Germany through Greece and Italy. Cabbage is high in vitamin C and riboflavin, low in calories and is purported to have anti-inflammatory and anti-cancer properties. In early folklore, cabbage leaves were often used as a poultice to relieve swelling. All cabbages can be eaten raw as well as cooked. Long cooking times diminishes the vitamin content. The addition of caraway to cabbage dishes is thought to reduce intestinal distress. 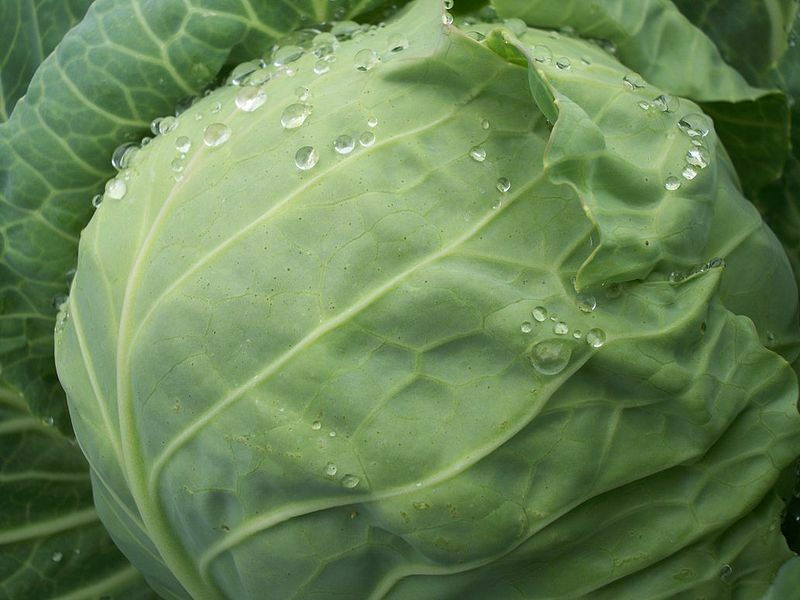 Green and white cabbages ("Kohl" or "Kopfkohl") are the most common form of cabbage and used to make sauerkraut and cabbage rolls. It is a Brassica oleracea from the Capitata (headed) Group. Its taste is mild when steamed, but glucosinolates, sulfur-containing compounds also known as mustard oil compounds, become prominent when cooked for a long time, lending a bitter taste and smell to the vegetable. Red cabbage is most often found cooked as "Rotkohl," a highly prized side dish most often served at holiday time with roast goose or sausages and mashed potatoes. The Latin name is Brassica oleracea from the Capitata Group, variety rubra L.
Rotkohl is often called "Blaukraut," "Blaukohl" or "Rot"- oder "Blaukappes" in Germany and "Blaukabis" or "Rotkabis" in Switzerland. It is redder in an acidic environment, so the addition of vinegar, citrus or apples when cooking enhances the red color. Sugar and baking soda will make it look blue (alkali). Common spices used when cooking "Rotkohl" are cloves, nutmeg, and bay leaves. Like most of the cabbages described here, it is sowed in the spring and harvested in the fall, making it a winter vegetable. Savoy cabbage is called "Wirsing," "Wirsingkohl," "Welchkraut," or "Wirz" in German (Brassica oleracea Capitata Group varietysabauda L.) and it is a looser-headed cabbage with a highly wrinkled appearance (curly). Its leaves are softer than white, green or red cabbage and they cannot be stored as long. On the good side, malleable leaves make it easier to use in cabbage roll recipes. They are also found in filled cabbage recipes and in soups and stews. Chopped or shredded, they make a good addition to salads. Kale, aka "Gruenkohl" or "Braunkohl" (Brassica oleracea Acephala (no head) Group), is very popular in mid-winter after it freezes. When kale grows in very cool weather, fructose is formed in the leaves through photosynthesis, but the growth of the plant slows, causing the accumulation of sugar (ripening). This makes it tastier, the longer it is left in the ground. "Grünkohlessen," where shredded kale is cooked and served with Kasseler or Pinkel sausage and browned potatoes, is an old tradition in Bremen and Oldenburg in northern Germany. See also "Grünkohlfahrt." Kohlrabi is one of the oldest cabbage types and was named in Pliny the Elder's encyclopedia of natural history. The vegetable you eat is the thickened stem of the plant, rather than the leaves. Kohlrabi can be shredded into salads or sautéed with butter and a bit of sugar for a simple side dish. You will need to peel the skin of the Kohlrabi since it is very fibrous and woody.